It just occurred to me that it took me a year of blogging to reach 19 Mezze dishes. If I am ever to reach my target of one hundred and one it is going to be years on this rate. I obviously need to do much better. So April is going to be Mezze month. The target is ten but I am not sure if I will be able to achieve that with a busy on call schedule this months. In fact I am on call today and I just came back from hospital after we spent the day saving a patient life (You don't get to say that much in my specialty so it feels good to brag about it when it happens). So as you can imagine I am quite tired and I am choosing something easy to start with, Hummus with Sujuk. I first tried this dish in Narenj, my favourite restaurant in Damascus. It is a simple but delicious combination of hummus and Damascene style Sujuk. A spicy cured(ish) meat I posted a recipe of few months ago. Sujuk is easy to prepare and will last in the fridge for a good couple of weeks. I usually make a patch, split it to individual portions and freeze it. It last for months. Make sure your hummus is room temperature before you top it with the sujuk. Other wise the fat from the meat will solidify and become very unappetizing. 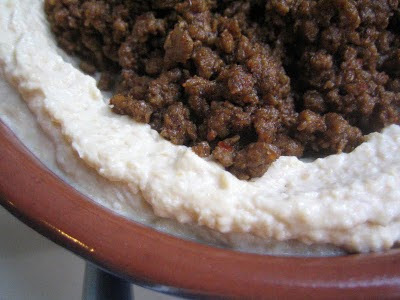 To serve, spread the hummus on the plate and top with hot Sujuk meat. You can add some toasted pine nuts for extra level of flavour. Serve with Arabic flat bread. Excellent! Excited to be seeing more of you, but perfectly happy for your blog to stretch out over the years! I can't wait to try making this at home. I was thinking of hummos and meat just this week! I am going to make it soon now but I need to make sujuk too! Sounds so good my mouth is watering ya kano! Welcome to my blog. Give this a try and let me know how it goes. I'm looking forward to more mezzeh recipies coming up! Great recipe, it is a variation on the hummus and meat you posted a while back and which we used for our Syrian Supper Evening. Sorry to hear about your on-call work, my partner Dr G does not seem to do any, but then i cannot think of any rheumatology emergencies. Give this one a try when you can. Sujuk is a very versatile ingredient. You can use in sandwiches, pasta, pizza topping or as in this recipe. Don't feel sorry for me, it was self-inflected. I do ENT so we almost as lazy as rheumatologist.